I qualified as an Optometrist from the Institute of Vision Science at Aston University in 2004. I am fully registered with the General Optical Council (GOC), a proud member of the College of Optometrists and also a member of the Association of Optometrists. 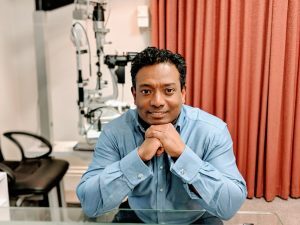 I attained my Refractive and Cataract Surgery qualification under the mentorship of world renowned Refractive Surgeon, Professor Sunil Shah at Ulster University in 2008. I remained in the field of refractive surgery for well over 3 years, a role I combined with my hospital work. I have been actively involved in community ophthalmology for a decade with the last 5 years spent within the Birmingham CCG managing glaucoma patients. I am also part of the complex glaucoma team at BMEC (City Hospital) and also the lead for a healthcare provider in Birmingham a role I thoroughly enjoy. I then went on to achieve distinction in my specialist higher qualification in glaucoma and medical retina. I am currently near completion of an M.Sc in advanced glaucoma diagnostic detection using the Glaucoma Module Premium Edition software which is one of the most advanced glaucoma softwares to date. Edgbaston Eye Clinic was set up to provide an in depth, affordable private eye care including a full ophthalmic diagnostic eye care service. Edgbaston Eye Clinic is equipped with all the latest ophthalmic imaging technologies for a more accurate diagnoses and monitoring of various eye conditions. The practice also house various Expert Consultant Ophthalmologists with expertise in different fields of Ophthalmology. Over the years, I have been very lucky to work alongside and under various expert Consultants in different fields of Opthalmology and the experience amassed in combination with further studies have been invaluable. I have also been very fortunate to have been tutored by some ‘fantastic’ brains in the field both in practice and in lectures.